Transition strips are a key safety feature of any flooring installation that involves one type of flooring transitioning to another. But, there are so many different profiles available that choosing the best one for your design can be challenging. How do you know which is best for your project? This is one of the questions we hear most often from architects and planners. There’s no one correct answer - the right transition strip depends on the types of flooring that are being joined together. Here are some tips for selecting the best transition strip for carpet (carpet-to-carpet, carpet-to-tile, carpet-to-wood, etc.). One of the most common profiles we see used with carpet are metal transition strips. We often recommend architects choose either a two-part “clip-top” transition, or a one-piece metal trim. 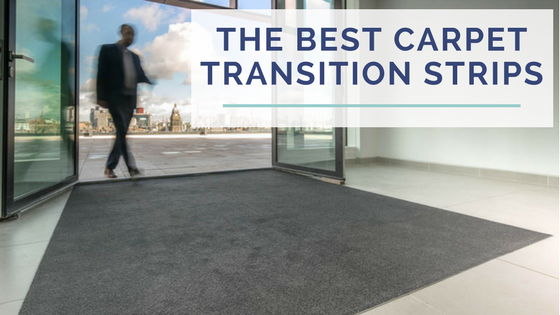 The decision typically comes down to aesthetics and installation - do you want an easy-to-install, slim-line trim, or do you want a two-part transition that will clamp down over the carpet? 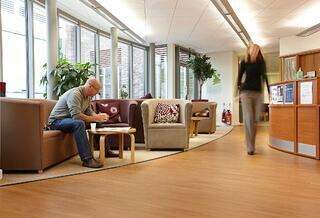 A one-piece metal trim, like those in Gradus’ Trans-Edge range, is appropriate for areas with heavy traffic. Trans-Edge profiles are made of aluminum and have PVC inserts that create a safe, durable transition. If your project will be subject to heavy foot-traffic or rolling carts, wheelchairs, etc., this is the profile for you. Further, the PVC inserts can help with the Americans with Disabilities Act (ADA) compliance because the insert can create visual contrast, showing people that there will be a change in flooring thickness. A “clip-top” transition, on the other hand, is made of two pieces - an aluminum base and a secondary piece that clips down on top, clamping down over the carpet. This protects the carpet’s edge, so it is a good choice if you’re worried about fraying or snags. Installation is slightly more complicated than a one-piece transition, but an experienced installer should have no problem with it. Still unsure which is best for your design? Budget may be the deciding factor, since these profiles can range from as low as $4 per foot to over $30 per foot. PVC is another common profile we recommend for carpet transition strips, because it is a durable, often cost-effective choice. There are two main factors that really set PVC profiles apart. First, many of them can be curved on site. 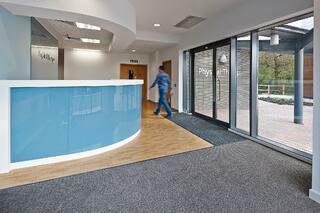 Many architects working on schools or retail outlets in particular come to us looking for curved transitions. In this situation, we recommend the Gradus Clip-Top fx profiles because they can be curved on site without the need for heat application or pre-fabricated profiles (curved metal transition are generally pre-fabricated to a template). Secondly, PVC profiles come in a huge range of colors, so you can choose the finish that will look best with your design. Have a blue carpet and want a matching blue transition? There’s a PVC profile for you. The possibilities are endless. PVC transitions tend to be less expensive than the metal profiles detailed above, usually costing $4-5 per foot. The absolute most important factor to consider is finding the profile that fits snugly between the two pieces of flooring, so it won’t move when it’s walked over. Once the profile is selected, it needs to be installed properly. First, ensure that the carpet fits neatly beneath the transition strip to protect its edges from unraveling and to prevent a trip hazard from being created. If the profile isn’t installed correctly, it can easily come loose, cause damage, and create a trip hazard. 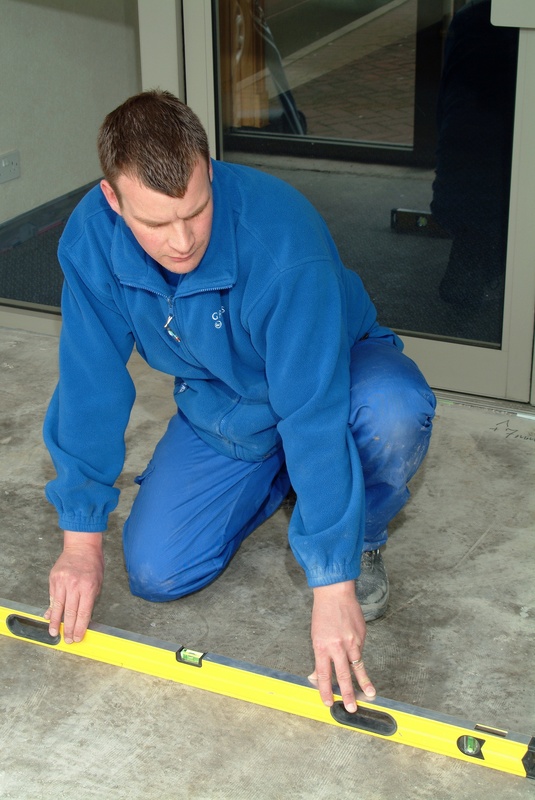 It is essential that a quality adhesive is used for installation. We recommend using either a construction tape (dry adhesive) or a wet glue, depending on the manufacturer’s instructions. It is especially important to note whether the manufacturer recommends a two-part “screw and glue” installation. If this is the case, make sure you follow both steps and don’t take any shortcuts. Please don’t hesitate to contact us if you have any questions about carpet transition strip installation methods or profile options.